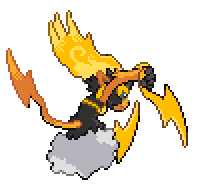 Chimchar Dex: This Pokemon was struck with lightning, somehow surviving and having statically charged yellow fur and charred black fur as well. Monferno: This Pokemon has found a way to form full lightning bolts. This Pokemon jumps from tree to tree wherever the Pokemon jumps a black scorch is left. Infernape:The cloud this Pokemon floats on is statically charged. The electricity on its head is powerful to burn anything it comes in contact with. The design for Delta AInfernape reminds me of a mixture of of course Infernap, with Raichu a bit, then a bit of Tonadus/Thundurus. Great design though! I like the idea, but yeah, the Infernape’s straight up holding the end bit of raichu’s tail. Yeah, I like the stats too, changing up the uses of it by making it a spec.attacker. Thanks for mentioning me BTW. You might wanna make back sprites. That goes for other deltas too. Whats the process by which delta concepts get approved and added to the game? I don’t think they’re going to add anymore deltas into the game (sadly), I guess we just love to make deltas so we can show the world our creativity (us being everyone who designs deltas)!